I’ve categorically failed to post a best of 2018 and I’m still struggling with all manner of other time consuming activities which have made a real dent into my reading/blogging time. But, I’m nothing if not stubborn, and with a number of great books on the shelves waiting to be read, I’m adamant that I’ll keep this blog alive. The first book in Scott Reintgen’s series was thoroughly enjoyable, hitting all those satisfying tropes like the sci-fi military boot camp and the big-bad shadowy corporation behind everything. The cast of characters was novel for their diversity and their real-world problems but also very easy to empathise with as they fought and competed to ‘win’ their opportunity to visit an alien planet and make their fortune. In Unleashed, the group have landed amongst the alien Adamites to a surprisingly warm reception. But, as ever with Babel, nothing is as it seems as the company continue to pull strings behind the scenes for their own nefarious purposes. However, unlike the opening novel, the tension here loses some of its power and the author is forced to rely on repetitive emotional confrontations to pull the story along. Don’t get me wrong, Unleashed is still chock full of excellent world-building and intriguing prose, and the author doesn’t shy away from treating his actors with the very real characteristics of the current, teenage generation’s attitudes and ideas. Where things seemed, to me at least, to stall was in the need to bridge the gap between the first book and the third, setting up a scenario that will clearly pay fruit but which felt a little too drawn out. It is perhaps a difficult ‘second album’ issue. Unleashed is still a great read, especially for those invested in the characters and world (of which I am sure there are plenty). We see the protagonists grow and mature, dealing with difficult circumstances and relationships all the while navigating an alien world. Trust and truth are tested to the extreme as the group try to understand where they stand, though, in the end, they realise it is only together that they will survive the various honey traps set for them by Babel. The last quarter of the book explodes with potential, setting up the next novel perfectly. Unleashed is a title that could refer to all manner of ideas explored in the book, from the substance the crew are sent to mine, to their own anger and frustration at Babel, or the plans of the Adamites themselves. Nyxia continues to be an intriguing series and the story of the teenage crew remains as gripping and fraught as ever. Sometimes I feel guilty for reading a book so fast considering how much effort the author must have put into the novel. But, it’s also a testament to just how enjoyable it was to read, and that goes doubly for Nyxia. Billed as a YA novel, Nyxia definitely hits all the right notes for a coming-of-age adventure yet it is also a brilliantly written, gripping tale of a young man struggling against the odds to ensure that his family and his future are more than his social status would dictate. Emmett is a thoughtful, brave, complicated teenager who, as the protagonist, carries the story on broad shoulders. Plucked from poverty along with nine other hopefuls, he is whisked away on a journey that will change his life forever, though only if he can survive. In a near-future, Emmett and the others are contracted to travel to a distant planet by a company with technology far beyond his wildest imagination. However (and there’s always one), whilst the explorers will be made exceptionally rich, they must compete with each other to secure their place with the company. It’s a competition of ruthless rules, changing goalposts and huge rewards; for a group of impoverished teenagers, the stakes are massive. Nyxia captures all of the emotionally charged games, the tentative alliances and the brutal struggle to succeed brilliantly, keeping the pace high and the action engaging. The company, Babel Communications, and more importantly the man in charge, Marcus Defoe, is both alluring yet dangerous though even Emmett’s street smarts can’t give him the edge he needs to take control of the situation. Constantly on the back foot, desperate to succeed and being forced to make choices designed to break even the toughest, mentally and physically. Yet, looming behind the competition is the planet Eden, it’s humanoid population and, more importantly the substance they are all travelling for – Nyxia. It’s something no-one really understands containing power and ability of epic proportions and a history that Babel is trying to hide. Nyxia is a gripping, engaging and fun read. Scott Reintgen has created an amazing cast of characters with a protagonist who is captivating in his honest struggle to survive yet succeed along with worldbuilding that holds the promise of amazing sequels. Another first for me as I review both the book and the audiobook of Revenger by Alastair Reynolds. Check out the blurb below.. This has been billed as a Young Adult science fiction novel and, whilst it isn’t the usual hard sci-fi of Alastair Reynolds, that takes nothing away from story. It’s still brilliant, big idea stuff and, as ever with Reynolds, the worldbuilding is wonderful, creating a universe both far futuristic and alien with equal measure. Hints and ideas come together to form a fantastical picture, mixing space ships and pirate lore to produce an engrossing setting. Written as an account of events by the younger sister Fura Ness this is a tale that will engage readers of all ages. Signing on board the ‘Monetta’s Mourn’ in an attempt to change the fortunes of their family, the siblings are soon caught up in all manner of trouble. Whilst the crew they’ve joined are a hardened bunch, there’s a difference between expeditioners and pirates and Fura gets to see the truth of it first hand. Her sister taken hostage and herself left on a broken ship with only dead crew mates for company, Fura begins a transformation that will see her put everything aside to seek her vengeance. There’s something that harks back to Treasure Island here but there’s also something darker and edgier at its heart. The cadence of the story, the slang and colloquial language, the hints of a much greater conspiracy and the immediate threats all combine into a gripping page-turner. Fura is an uncompromising character but it isn’t until the final chapters that things really become clear. 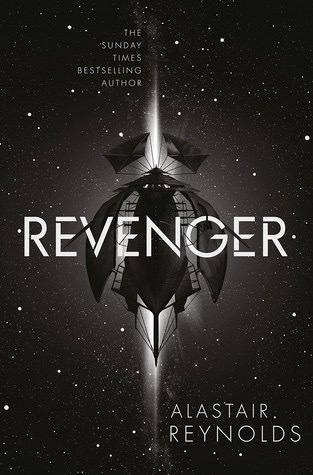 Revenger is a tale of retribution and in no short measure; the idea so cleverly woven into Fura’s narrative is how that desire for vengeance warps a person in ways that make them closer to their enemy, closer to the dark, than they ever expected to be. Alastair Reynolds is a fantastic novelist and his first foray into YA fiction is nothing short of incredible. This is the first audio book I’ve listened to and it was an interesting exercise. The narrator chosen is clearly skilled at acting as she gives voice to the numerous characters that Fura encounters. Though some sounded different to how I imagined them, I’m positive this is only an issue as I chose to read Revenger first. Listening to the book offers a different perspective on the story – a slower, more considered one. The ensemble of actors come to the fore slightly more yet the pace of the tale remains, slowly dragging you deeper into Revenger with each chapter. Personally, I felt that the audio version didn’t do enough justice to the change within Fura that felt so obvious in the book. This is a tale of revenge; of total and absolute vengeance. Fura does everything it takes to find her sister, including some fairly extreme measures. From the teenage girl she was, at the end of the story she has become furious, unhinged to some degree and unwilling to give any quarter, reshaped mentally and physically to the point that her own sister struggled to recognise her. That is what makes Revenger such a fantastic read. In the end, Fura is closer to her enemies than she’d like to admit yet it isn’t something she’d change. Audio version or book, the last chapter of Revenger is a bombshell of a conclusion. 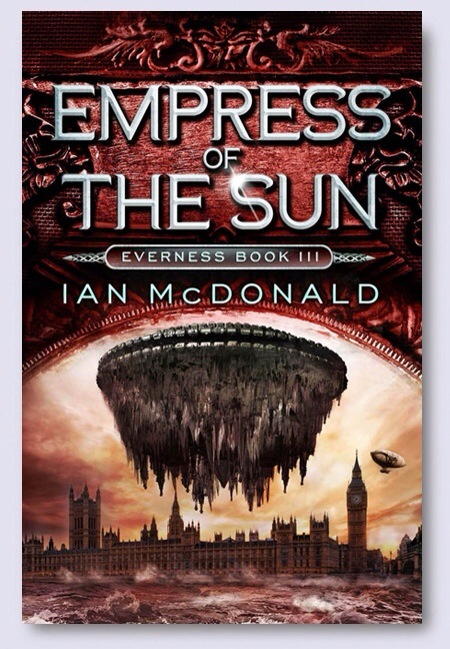 The third instalment in Ian McDonald’s Everness series, Empress of the Sun pushes the notion of YA literature to its boundaries. I’ve only read two young adult series before: the ubiquitous Harry Potter novels, devoured whilst completing my Masters, and Phillip Pullman’s His Dark Materials trilogy, enjoyed whilst recovering from a broken leg. Ian McDonald’s series deserves to be mentioned alongside those other brilliant YA, coming-of-age type adventures. However, there is a certain darkness and a certain budding adulthood that is maybe lacking in either of those mentioned. Both Rowling and Pullman’s novels feature struggle and hardship, loss and the battle of good against evil. But, where McDonald diverges is in his ability to make grey those hard choices, to muddy the moral waters of his young protagonist. He also does this against a background of youth as it exists today, particularly in London. The obsession with phones, computers, fashion and football all mingled in with teenage angst that even made this ageing beard hark back to those awkward times. The Everness series follows Everett Singh as he attempts to track down his father, a scientist kidnapped by a shadowy organisation and taken to a parallel world. Everett is, himself, a bit of a maths wizard and discovers that his father has given him the ‘infundibulum’ – a map to understand and conjure portals to anywhere I’m the multitude of parallel Earths. The series is one long, fantastic thesis on brilliant world building as Everett discovers more worlds, more alien Earths and more strange and intriguing characters – some alternatives to those he knows on his own Earth. It’s on these adventures that he becomes a crew member on an airship (think Zeppelin) as he jumps around the multiverse, battling those who took his father, a version of himself cruelly made into a cyborg, an unrelenting swarm of nanobots intent on total sublimation along with his own angst and fears. Empress of the Sun does two things brilliantly. It shows the development of Everett as he loses his innocence and idealism and takes on tough, horrible choices. It shows the change from boy into teenager and the struggle it can be. But, importantly, it places Everett firmly in a world (or worlds) where nothing is black or white. The other thing it does is provide a thrilling adventure in a stunningly creative setting where dinosaurs are super evolved beings with millions of years in advanced technology. Everett and the crew are being hunted, their backs to the wall, but still needing to save the known worlds and stay one step ahead of their enemies. Ian McDonald manages to weave a number of themes and stories brilliantly into his series. His science is believable and deftly handled, his characters (especially the teens) crackle with life, his multiverse is fascinating and the plot is driven with intrigue, emotion and conflict. The Everness books are wonderfully and beautifully written, epitomising what YA literature should be; hugely entertaining yet thoughtful and intelligent.